Should You Use a Life Insurance Loan or Get a Personal Loan? A personal loan, also known as a “signature loan” or an “unsecured loan,” is a loan made to you without collateral. Your interest rate is based on your credit score. The better your credit score, the lower your interest rate. A poor credit score may disqualify you from receiving a personal loan. Personal loans and life insurance policy loans both have strengths and weaknesses, as this article explains. Securing a personal loan can be easier and faster than, for example, qualifying and getting approved for a home equity loan. Unlike a bank loan, you don’t have to go through an underwriting process to get a personal loan. And most personal loan contracts do not restrict how you use the money. A personal loan is a form of installment debt. That means your loan will have a fixed repayment schedule and virtually no flexibility. You’ll probably pay a higher interest rate – and it may be significantly higher. You’ll likely pay fees, including a loan origination fee. Sometimes there’s even a penalty for paying off a personal loan early. Be sure to take a close look at origination fees, at how the interest is calculated (beware of pre-computed interest, which means you’ll save virtually nothing if you want to pay your loan off early), and penalties buried in the fine print. As long as you make your payments on time, everything should be fine. But what happens if the unexpected happens and you fall behind? Without collateral to cover your debt, your lender may sue you in court, garnish your wages, and, in extreme cases, force you into bankruptcy and ruin your credit rating. Dealing with unsavory lenders can be even more risky – they know where you live and can show up at any time. What Is a Life Insurance Policy Loan and Why Should You Consider One? A life insurance policy loan is a loan from a life insurance company, using your permanent life insurance policy’s cash value and death benefit as collateral. There are no specified repayment terms or requirements with a life insurance loan. You can set your own repayment schedule, and if you need to make a payment late or even skip it altogether, you can. While that gives you flexibility, you could find yourself in difficulty if you’re irresponsible with your borrowing and repaying. Discussing things with a qualified and knowledgeable life insurance advisor can help you avoid trouble later on. If you have a history of not being responsible with credit, you should consider carefully your ability to be responsible with a life insurance policy loan. You shouldn’t consider a life insurance policy loan unless you have the personal discipline to repay your loan on schedule – even if it’s a schedule you set up. A life insurance loan is an extremely simple and quick source of cash: no loan application is required. You can have the money in hand as soon as two to three days – not weeks. With a properly-structured dividend-paying whole life insurance policy as your collateral, you have full access to 85% or more of the cash value of your policy beginning the very first month. When you borrow against your life insurance policy, your policy can continue growing, just as if you hadn’t touched a dime of it – if your policy is from one of the handful of companies that offers this feature. You decide if and when to repay your life insurance policy loan. But unless you’ve borrowed to create a retirement income stream, you should plan to repay your loan to keep your policy from lapsing. If your unpaid balance and interest ever grow so large that they threaten to exceed your policy’s cash value, your policy could lapse, so you and your advisor will want to watch that carefully. Still, if you have a down month or two, or six, you can skip a few payments. It’s your schedule. And there are no penalties, fees, or black marks on your credit report if you’re late or miss payments. Another reason to repay your life insurance loan is to replenish your cash availability for the next time you need money, or to build a retirement income stream. If your loan is not paid off when you pass away, the unpaid balance, including unpaid interest, will simply be deducted from the death benefit your beneficiaries receive from your life insurance policy. A life insurance policy loan has no impact on your credit rating, whether you pay it off or not. That’s a fair question. For example, BankRate.com flatly says life insurance loans are a bad idea. Go ahead a take a look at their arguments. But read them carefully. BankRate.com makes many blanket statements, with no proof to back them up. Their article on life insurance policy loans is full of unsubstantiated opinions and misinformation. We’re not mind readers here, but we do know the owners of BankRate.com sell advertising to banks, loan companies, and others who would like to loan you money. They may even earn a commission or a “finder’s fee” if you do business with one of their advertisers. But if they can make some money when you do business with one of their advertisers, are they likely to admit there’s a better alternative? Probably not. So don’t take their arguments at face value. Examine them closely. Do they make sense? Are they backed up with facts? Could they be biased? Take a look at reports from individuals who have taken life insurance policy loans the Bank On Yourself way. These stories are real-life experiences, not theories or opinions. You can also read our article on how life insurance policy loans work to get a better understanding of the process. So what sets a Bank On Yourself-type life insurance policy loan apart from any other source of funds? First, Bank On Yourself-type policies are high early cash value life insurance policies, meaning they build cash value quickly. In fact, while the financial gurus say you may have to wait several years before you’ll have enough cash value to borrow against your policy, a Bank On Yourself Authorized Advisor will show you in black and white how you’ll typically have enough cash value to borrow the very first month! Second, the life insurance companies preferred by Bank On Yourself Authorized Advisors offer non-direct recognition policies. That’s a fancy way of saying your cash value will continue to grow while your loan is outstanding, just as if you hadn’t borrowed. Only a handful of life insurance companies offer that valuable feature. Third, you – not some lender – are the one in charge of your repayment schedule. Pay your loan back on your terms. Just work with your Authorized Advisor to be sure you’re paying back your loan responsibly. And remember, you have plenty of leeway in how you repay your life insurance loan. Finally, what sets Bank On Yourself-type policies and loans apart is the caliber of the advisor you’ll be working with. Your Bank On Yourself Authorized Advisor is with you for the long haul, willing to offer counsel and guidance at every turn – without charging you a nickel. Bank On Yourself Authorized Advisors take significant commission cuts to be able to offer you high early cash value policies – after all, those policies are designed to funnel much of the advisor’s commission to you, in the form of higher cash values that you can access how and when you please. Bank On Yourself Authorized Advisors are passionate, and they want to help you make the best choice. What’s Your Next Step if You’re Considering a Life Insurance Loan? 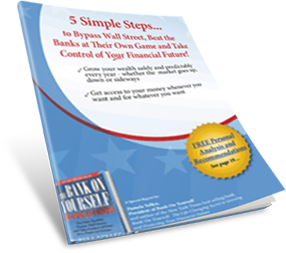 Before you do anything else, download our free Special Report, 5 Simple Steps to Bypass Wall Street, Beat the Banks at Their Own Game and Take Control of Your Financial Future. Then, to get specifics on how a Bank On Yourself-type policy can benefit you, request a free Personalized Solution from a licensed Bank On Yourself Authorized Advisor. You’ll get a referral to one of only 200 advisors in the US and Canada who have met the rigorous training and requirements to be Bank On Yourself Authorized Advisors. The advisor you work with will look at your overall financial picture to help your family reach your financial goals and dreams, and you’ll discover how to “Bank On Yourself” today!